I can’t think of a better place to ring in 2017, than at Walt Disney World!! The magic would be amazing!! There are a few great choices for you to celebrate New Years Eve… From dinner at California Grill Disney’s Contemporary Resort to celebrations around World Showcase at Epcot and waterfront at Narcoossee’s at Disney’s Grand Floridian Resort & Spa. 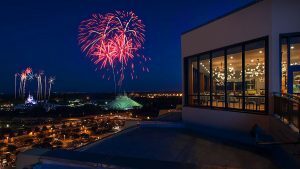 Let’s start the party with dinner at California Grill New Year’s Eve Dinner – With spectacular views of the Magic Kingdom Park, this dine-around style gala features cooking stations throughout the restaurant. 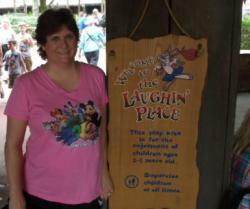 Plus, a host of favorite Disney Characters will make appearances. The price is $650 per person and takes place from 7:30 pm- Midnight. Victoria & Albert’s New Year’s Eve Dinner – is another great choice. A luxurious evening in this AAA Five Diamond restaurant features gracious “butler-style” service, live harp music and personalized menus to remember the special evening. This sounds absolutely magical!! Dining is available between 6-7:45 p.m. The price is $600 per person. 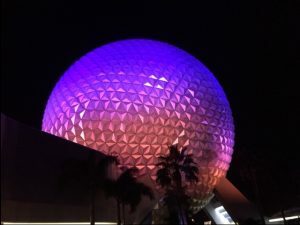 New Year’s Eve at Epcot World Show Place –Oh to be in the middle of the magic! This all-you-care-to-eat extravaganza is a real family affair featuring photo op with fun vignettes for posing (but no Disney Characters) and Disney tunes. Dining is available from 3-9 p.m. The cost is $72.90 for adults and $44.38 for children (ages 3-11). And, later in the evening, you can head out to the promenade for fireworks over World Showcase Lagoon to welcome 2017. I’m sure it will be breathtaking!! Monsieur Paul New Year’s Eve Dinner – In the elegant upstairs dining room at the France pavilion at Epcot, you can feast on a four-course, fixed menu of classical French cuisine. Six different times are available on New Year’s Eve: 11:45 a.m., Noon, 2:15 p.m., 2:45 p.m., 5:45 p.m. and 6:15 p.m. The price is $110.81. Plus, a special late-night dinner with two seating are available at 8:45 and 9:45 pm. The price is $305.03. New Year’s Eve Dinner – Located at Disney’s Grand Floridian Resort & Spa, this generous four-course menu is offered with seatings between 5 pm and 5:45 p.m. A five-course menu is offered with seating from 8:30-9:25 p.m. for a late-night celebration with live music. The first seating $150 for adults and $70 for children ages 3-9. The second seating is $255 for adults and $95 for children ages 3-9. If you would like help booking any of these magical places to ring in the New Year, one of our Travel Pixies will be happy to help!! We add the extra pixie dust to all of your vacation plans! Here’s to a Happy New Year!!! Previous PostDisney Cruise Line 2018 Itineraries!Next PostDiscover Adventures By Disney!